Description: Pecos Bills is one of the most popular quick service dining locations in The Magic Kingdom. Serving up burger, fries, chili, salads, and pulled pork there is something for everyone. 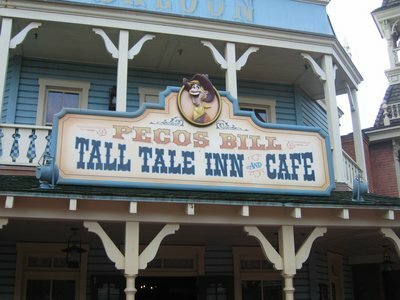 The best part about Pecos Bills is the Fixins’ Bar where you can load up your entree with toppings such as peppers, onion, pickles, nacho cheese, lettuce, and tomatoes to name a few. You can order your meal at a computerized kiosk or directly from a cast member. The restaurant opens at 10:30am and it is a good place to grab an early meal. If you want to eat lunch at 11am or Dinner around 4:30 you will find it quite easy to find great seating here. The restaurant does get busy during typical dining hours. The Food: My pick for a great meal here is the taco salad piled high with my choices from the fixins bar. You also will not be disappointed with the 1/3lb angus burger. Kids can grab a burger, PB&J or turkey sandwich. If you are looking for a snack that will really hit the spot grab a cup of chili! This entry was posted in Dining, Frontierland, Magic Kingdom, Restaurant Spotlight and tagged burger, Dining and Restaurants, Frontierland, Pecos bills, quick service. Bookmark the permalink.